Click the button below to add the 15” Magnetic Backed Flexible Resin Bonded Diamond Smoothing Disc to your wish list. The 15”diameter (175 square inches sanding surface) magnetic backed Resin Bonded 300 grit diamond smoothing/sanding Disc puts a smooth finish on finished ceramic surfaces. It is a pliable, durable magnetic backed resin bonded fiber that is saturated with fine diamond particles. 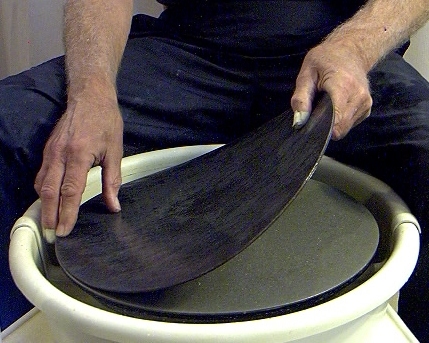 The smoothing disc is used to sand, polish and flatten ceramic material . This disc attaches magnetically to any rigid steel surface such as an electroplated diamond grinding disc. It can also put a fine hone on metal trimming tools and ribs. Use with water. This smoothing disc should be "broken in" by turning it at varied speeds, WITH WATER, and apply even pressure with a brick or any other coarse flat ceramic material. The texture of the smoothing disc will flatten out and excess bonding material will wash away, then you'll be ready to go. If you want ME to break it in for you, just e-mail and I'll do it before shipping.